Indulge your desire for blissful contemporary design when you bring home the Anna Blue Sofa Chaise. Made for everyday living, the furnishing is enveloped in 100% polyester that gives you the support and soft feel you're seeking at the end of a tiresome day. 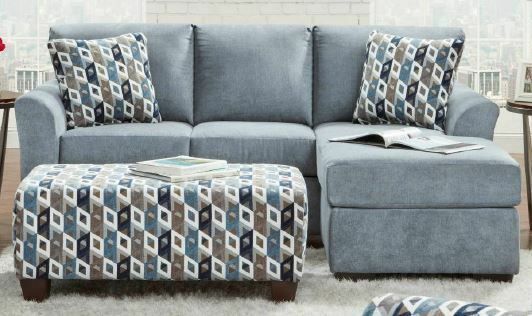 The blue-grey color scheme provides your living room with a soft accent color that has the versatility to blend in with numerous existing decor. To top it all off, the chaise seating is what dreams are made of, giving you the perfect place to plop down with your favorite read. Accent ottoman pictured is not included. Indulge your desire for blissful contemporary design when you bring home the Anna Blue Sofa Chaise.